Seems that ex banker and YB for Bukit Begunan is ‘rumoured” to be switching sides. However,its not from BN to any Pakatan parties. Like the Astro mixed FM ‘I heard a rumour” this is the early virus circulating in Kuching City to Sri Aman to the far reaches of Northern Limbang. Any truth? If the calculations are correct it seems that Entulu is gaining momentum and using James Masings theory of “ONLY YBs MATTERS” to force a “deal” in surrendering the “PRS chair” to him. 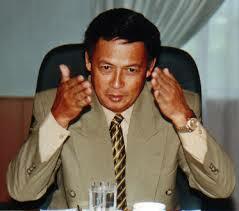 Only Last week it was speculated that YB Liwan Lagang ADUN Belaga has taken the bold step to move into Entulu’s camp. Has Mong been informed to do likewise? It also seems that he has been short changed is the word in some political deals and he has suddenly woken up to a fine sunshine Monday morning to be in “Entulu’s camp” . Of course, Entulu has every right to be overjoyed with ENTHUSIASM but with CAUTION. His grabbing of ultimate power is close and within his reach. Eventhough James has the upperhand according to a machai in James camp he must find ways to really curb the threat of Entulu before he himself gets EXTINGUISHED. Entulu will fear no-one especially when the signals are all favouring him. BN does need this type of “dayak leader” to check the ever growing threat of dayak unhappiness with the present ruling government. The dayaks know that PKR can offer them an alternative for now eventhough its not long term solutions. With Mong Dagang a willing lieutenant deserting James it seems that Entulu’s ever growing power will be uncontrollable. What options does James has? Another pre-emptive strike? These two people pictured with James are also looking at saving their own political lives or else they will be left deep and wet in the dungeon. Remember we asked,”Is the Walikota Kapit Philimon Nuing or Pol.Sec Wilson Uggak with James or Entulu.? In 1987 this song by Bananarama British girl’s pop group of the 80’s “I Heard a rumour” was on everyone’s lips as one will say to each other,Ah ha I heard A……” Today in Astro Mixed FM every morning 8 am-8.30am there is M$100 to be won if you have “I heard A rumour” spin in which the deejays will determine whether your rumour can be substantiated and enough to convince the Malaysian public. What was considered a rumour wherby SPDP No.2 man to be challenged seemingly is taking shape as it is already and successfully coverd by the main stream media today. Yesterday after being informed by our sources that it is already 99% certain that “Tiong will take on Nyarok for the No.2 ” we went a step further by clarifying with a very close aide of Nyarok. It was late afternoon around 4.30pm 29th July 2009 when we managed to track down the aide and spoke to him. This is an excerpt from our conversation,” Its a rumour where some people are trying to instigate Tiong to go against Nyarok vice versa.These two YBs are the bests of friends eventhough they might have some arguments here and there.It’s only natural” . Of course there is more to that now that some Hidden Hands are in play to push and oust Tiong out of the picture. We were informed that instructions has been delivered and with” to be followed ” to certain YBs to derail and neutralise Tiongs ever growing influence and to stop him at all costs. It was already agreed that the TDC scheduled for the 20th and 21st of November 2009 in Kuching and to be declared open by PM Najib that the Top Posts will see Mawan maintaining his grip. He will not be challenged. Nyarok’ s man has also unknowingly uttered words that has got to Tiongs ears that Tiong holds too many positions in Youth Chief,Treasurer and Vice President. If you were Tiongs man what would you do? The ripples have provided more than an opportunity to the Hidden Hands to move in and ensure that Tiong is thoroughly checked . What is interesting is that there are certain individuals speculated to be against the idea of the merger and with Nyarok being challenged it seems the rumour of Entulu taking on No1 in PRS has again resurfaced. We receive smses ,”Its confirmed from Bintulu that now YB Liwan and Mp Billy has switched camps and are banging on MP Entulu to take on YB James Masing. Now the question remains,” Is the Walikota Kapit Philimon Nuing or Pol.Sec Wilson Uggak with James or Entulu. ?” If both goes James has losts his grip on the Rejang Basin and he will fear the worst says a political science analyst. The “Cawat issue” we wrote is just a reminder that in many instances political problems should be solved not by “hoodlum/hooligan ways but by a more matured without the so-called “FIRE and BURNING of FLAGS“. Thank GOD the message was delivered or else there would be serious consequences and repercussions. So much has happened ever since and PRS was also embroiled in a crisis which was eventually solved this year as the opposition made inroads in Parliament and 308 was the time ROS under instructions had no choice but to recognise James as the legitimate President instead of Larry Sng. We say as always,”There is already tension and CM will not want to wait for November.It only takes a day mind you 4 hours to register PRS..Be warned that CM takes no prisoners.Join Together or Ship out is the word..